It feels like an age since I last posted! It’s actually just a bit more than a month, but in blogging-years, that’s rather a lot. I’ve been busy with many things including moving into our new house, recording prize songs from the Mirrorball Swing Photo competition and writing/recording new material for The Punch. I’ve also taken a part-time job working for Kumori as an admin assistant. This means spending money for new musical ventures! But it also means a bit less time for social media presence… I’m working on restoring the balance. Bear with me! 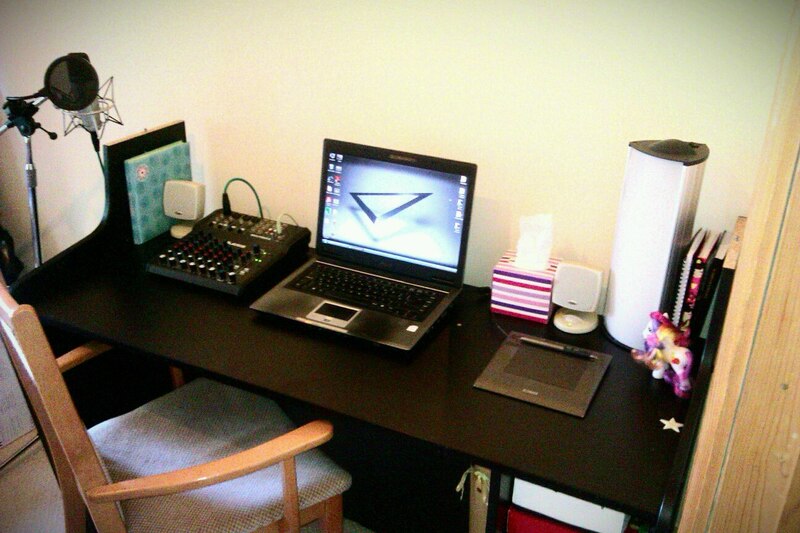 My new workstation. Complete with pony, of course. Last night I had the pleasure of attending a gig in Birmingham. I went to see Totally Enormous Extinct Dinosaurs. I’m currently trying to upload the footage I took to YouTube, but given our thin sliver of bandwidth, it has so far taken about four hours to get to 64%. One Response to "The Obligatory ‘I’m not dead’ Entry"
Balance is so hard! I’m glad to hear you’re doing well though. *hugs* I love you!